This route crosses the Sierra Cabrera range. The South side is off-road, climbing up from Sopalmo to the top (or descending if you’d rather) whilst the North side is a quiet tarmac road with some steep sections. The locals seem to do the gravel road on short travel hard tail mountain bikes, but my ‘Uncle Juan’ was ideal and made the tarmac less tedious. I’d been really excited about this and it didn’t disappoint. 8 miles of a winding gravel road with stunning views, what’s not to like? I admit that the first mile with its 10% slopes had me worried, but it slackens off to an average of about 5%. When you finally get to the junction at the top, turn left and left again to tackle a punishing 25% climb to get an amazing view from the 3000ft summit of the range. It’s been freshly tarmacked and feels a bit like Hardknott Pass, which is great if you’re getting a bit homesick. Don’t pinch my Strava KOM though. Putting the slicks back on, it was time for some road riding. This time I headed inland and once I’d got off the busy (but totally safe) A370 I was climbing past Bedar on a stunning road with superb hairpins before finally dropping down towards El Marchal. I rode on further to get the distance in, but even if you then just climbed back up and descended back past Bedar you’ll have had a decent ride with a proper climb. 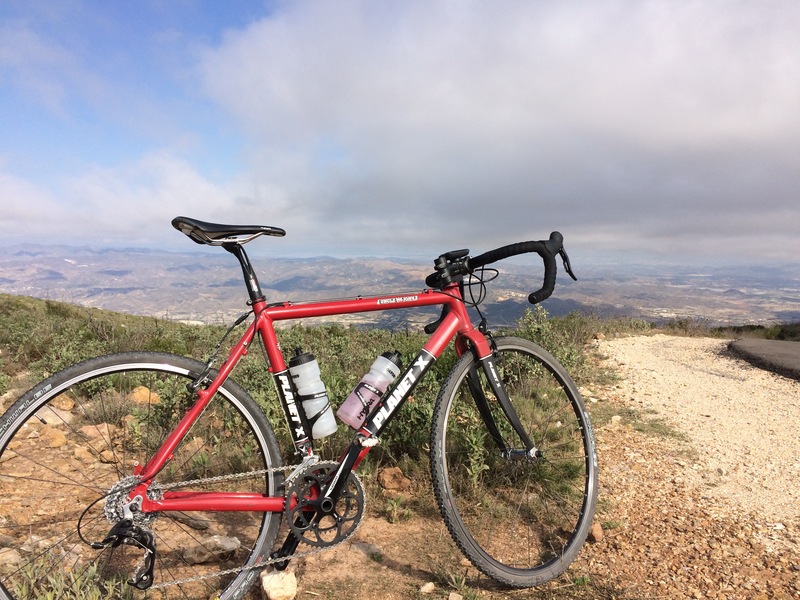 Heading out through Turre and up towards the little mountain resort of El Cortijo Grande is a road that has become my favourite climb ever. The road takes you up into the hills and apart from a short section that is more like a farm track, the surface is superb. It’s well signed for ‘Sierra Cabrera’ so just sit back and enjoy the views and intricate hairpins. In an hours worth of climbing I saw one car and one man herding his goats. At one point you climb between a few houses in a remote little village then you’re back in the wilderness again. Eventually you approach the junction of the Ruta TransCabrera so you’re obviously obliged to tackle the extra section right to the top. I descended down the Ruta Transcabrera road to Turre to make a loop of it, though this loop in reverse could be equally rewarding. No matter where you live, you can get bored with the local trails and roads – even in the cycling paradise of Macclesfield. In order to get to anywhere fresh and interesting you have to pedal the same old routes that you use every time, with the return leg of your loop covering equally familiar ground. Obviously one solution would be to relocate every year or two, but even if you hate moving house less than me you’d have to agree that it’s a little drastic. You might have the option of driving somewhere new to ride a loop, but there’s still a lengthy drive home when all you want to do is make use of your shower and kettle, and if you’re riding off-road then you’ve also got the messy business of getting a muddy rider and bike into your lovely clean car. Much as I like a good loop, I’ve recently had a yearning for a decent point-to-point ride. They somehow have the feel of a proper journey and if you plan it so the destination is home, then what better motivation to keep slogging on than getting to your own home comforts? So this morning I took advantage of a lift into Manchester with my mountain bike, from where I could spend £5 and 25 minutes on a train journey to Littleborough. This unassuming town just north of Rochdale might have many amazing attractions, but for me it’s proximity to the Pennine Bridleway and the potential for a 50 mile slog down the Pennines back to Mac made it the perfect destination. I’ve got a lot of love for the Pennine Bridleway. A fully signposted, long distance route suitable for mountain bikers is a quiet triumph of English outdoors access in my books. As well as providing some properly rugged and surprisingly remote riding, many stretches of the route are never too far from a train station – plenty of escape options if I’d over-estimated my fitness. My plan for today was to follow it South towards Hayfield, from where I could assess my energy levels and decide on how far to venture into the Peak District. 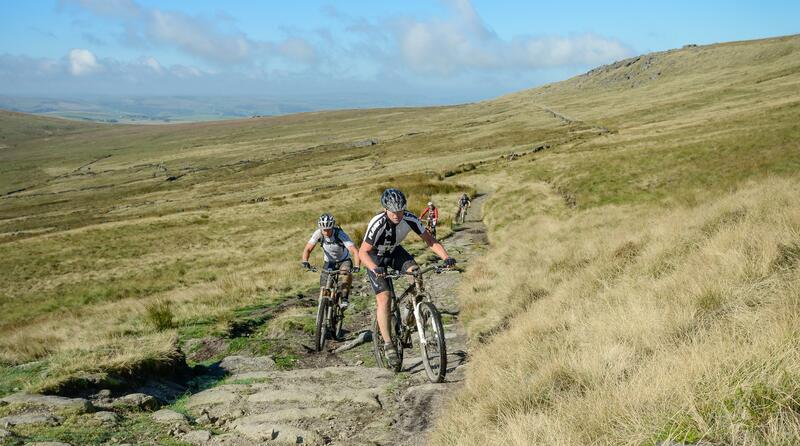 EDIT: I now run a cycle company that offers the chance to ride the whole Pennine Bridleway as a four day tour. Have a look! After 32 miles, 5000ft of climbing and 4 hours of leaving Littleborough, I parted company with the Pennine Bridleway. Not that we’d fallen out (far from it) but it was veering too far South East into the Peak and away from home for me to commit to following any further. I still managed to make the remaining miles hard work for myself by tackling the Goyt Valley and a couple of stiff road climbs, but at least I was heading for home. The final damage at the end of the day was 51 miles, 7800ft of climbing and nearly 6.5 hours of pedalling time. A proper ride by anyone’s standards. But it was only as I got close to home that the punchline hit me: my local trails that I’d gone to such trouble to avoid became welcome sights and rather comforting. The unexciting local paths which routinely take me out and back on my regular loops were now massively appreciated by my aching bones and I’d never been so relieved to be on them. I’d nearly made it, all the way back home! Whilst I’m doing nothing more interesting than slogging up and down hills in the cold, here’s an unpublished piece from last August to remind us that winter won’t last forever! The word epic gets over used these days. We’ve probably got Hollywood to thank for that. But when it comes to mountain biking it’s quite subjective, as one riders’ epic is another’s standard ride. Remoteness and spectacular scenery can help to tick the ‘epic’ box and living by the Peak District provides me with plenty of opportunity. 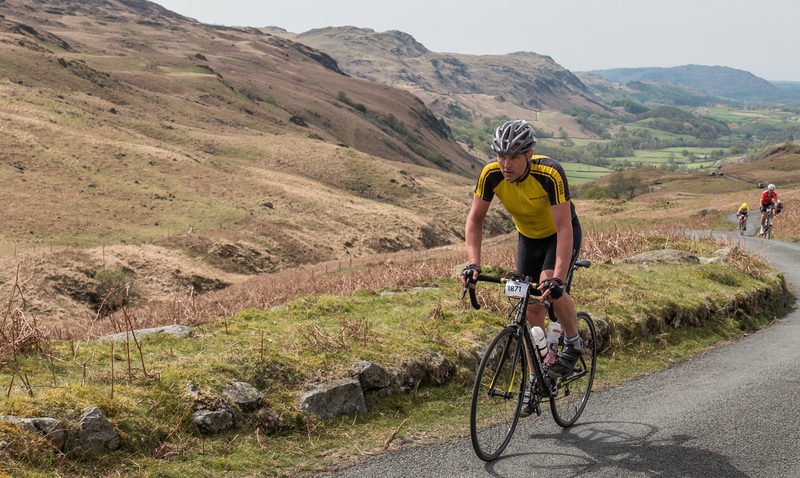 20 miles of Peak District riding tends to suffice for many riders. The trails here are tough going and even the descents feel like hard work. So what led me to take on an 80-mile loop with enough rough stuff to keep many riders happy for a few days? Certainly the training would be useful, but I was also in need of a skills boost: too much time mincing about on the road bike had given me fitness at the expense of technique. But more than that, I wanted the journey of an epic ride and (assuming I survived it) the satisfaction at the other end. Given that I would be out for over 10 hours, I left home in Macclesfield early and headed out into the Peak District. Within seven miles I’d gained some decent height but also a healthy sweat, partly due to the extra weight in my pack. I know riders who’ll happily turn up for a ride with just a multitool and a pump, but you’d be wise to carry more on an epic. Spare brake pads, chain lube, spare clothes and plenty of food and water are minimum requirements for this kind of caper. At this stage, I was plagued by doubts and questions. Can I do the full route? Should I do it? Why am I doing it? It’s best to ignore such questions and just get into the rhythm of the ride. The usual niggling aches and pains gradually eased and after 23 miles I felt I had enough behind me to stop for a quick sandwich break. I’d already done 3000ft of climbing and ridden what some people would class as a decent ride, but there was plenty more to do. Skirting round Mam Tor gave a sense that I’d arrived at ‘the good stuff’. Not that I’d been short of trails so far though, as my carefully plotted route cunningly avoided tarmac wherever possible. The only rain shower of the day coincided with my only mechanical, but it cleared by the time I dropped in at Fairholmes visitor centre for more sandwiches. The place was typically busy with people who’d come to pootle round the reservoirs. I love to see people getting out and riding, but my mud splattered face and bike marked me out as someone who was here on a very different mission. The Cut Gate Path epitomises ‘epic’ more than any other Peak trail. It doesn’t lend itself to short loops, so any crossing leads you into epic territory by default. Even an out-and-back crossing would make for a fairly hefty ride. After the push/carry/grind up Margery Hill you finally reach the Cut Gate path. It’s not everyone’s bag, and if you’re a trail centre fan then there’s a fair chance you won’t appreciate it at all. That’s because it’s the antithesis of a trail centre: there’s no obvious line to follow and you’re forced to think several moves ahead to keep some momentum as you pick your way down what feels like a riverbed. If you attempt it in winter or early spring then it actually is a riverbed. I’ve tackled it in all seasons, from blistering heat to winter blizzards (that really was epic…) though for me, late summer wins hands down. 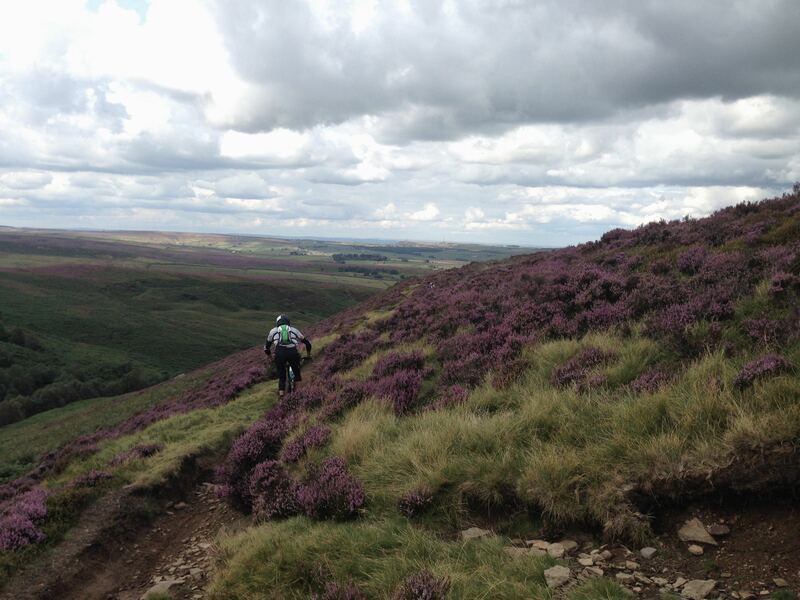 With mellow riding temperatures and the hills resplendent in purple heather it really is worth the trip. After 60 miles I’d reached the usual point in an epic where things start to get weird. My body had long since passed through it’s peak period of performance and was now just hurting. Any previous high heart rate enthusiasm had now given way to just simply slogging it out. Short rocky climbs that would usually be relished suddenly required exaggerated commitment and audible grunting. I cursed my route planning that stubbornly avoided tarmac. Did I not realize how I’d be feeling? Each chocolate bar gave precisely 40 minutes of burn time before my body reverted back to running on empty. I was into the end game. Counting down the last 10 miles I was feeling the full effects of the epic, in areas of my body that don’t even usually suffer. It was ten and a half hours since I set off that morning and I was totally spent – which is exactly how I intended to feel. Not everyone ‘gets’ the idea of an epic. Some might say that it’s too much of a good thing and that the last half isn’t even enjoyable. But it’s going beyond your usual limits that makes it for me, and I know I’m not the only one. Even as I write this on the day after, with aching neck and stiff legs, I’m already planning a route and excuse to get out and go through it all over again. For anyone geographically challenged, Andalusia is the Southern most region of Spain and consequently has more inviting temperatures than the rest of Europe in late October. I can’t claim to have gone there purely for the riding, but when the chance of a holiday presents itself you book your bike on the flight and then get the maps out. And that’s where things get interesting. As any Brit with an adventurous spirit knows, our Ordnance Survey maps are the best in the world bar none. Your British road cyclist can spread out a 1:50,000 scale ‘Land ranger’ map and plan a precision ride with few surprises. Unfortunately, Spain involves a little more guess work. The most detailed map you can buy is a lowly 1:200,000 scale by either Michelin or Marco Polo. Both are equally fantastic for the touring motorist and equally useless for the touring cyclist. They only show major A roads and the occasional minor road – and don’t be expecting any of those useful contour lines that we’re accustomed to. UK cyclists usually hunt out the yellow roads on the OS maps, safe in the knowledge that they’ll be quiet but properly surfaced. Our A roads are OK to ride on for a while but usually just to take us out to the nice quiet minor roads again. In Spain though, some A roads are absolutely fine to cycle on, but some are effectively motorways and should be avoided at all costs. 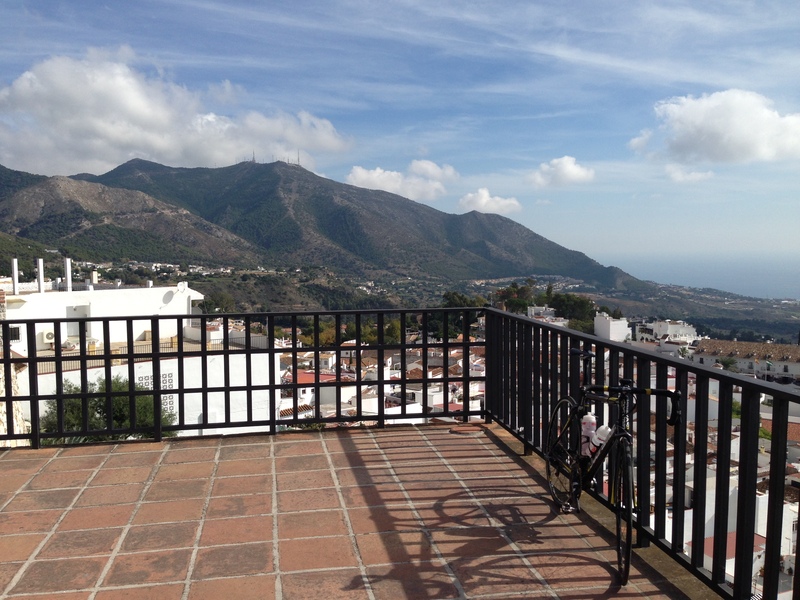 For instance, from my tourist haven on the Costa Del Sol near Cala de Mijas, the A-7053 was a great route out of the hustle and bustle yet only a suicidal cyclist weary of life would venture onto the A-7 along the coast. They’re both A roads though. Using ‘Street View’ in Google Maps can help plan your routes before you go. Even the A-7 looks tempting on these images though so don’t be too fooled, but at least you can get an idea of how wide the road is and even what kind of surface awaits you. At the other end of the scale, Google Maps shows every single track regardless of the surface. A route I planned in this way happily led me down a tatty concrete road that eventually deteriorated to a dirt track – not great with 23mm slick tyres! Maybe I’ll just take the cross bike next time. If you take the A-366 West from Coin you’re in for a treat (if you like climbing). It takes you up through Alozaina, Yungquera and over the Puerto de las Abejas at 820m and apart from a few small dips it’s a glorious 15km climb. The gradient is mostly nice and steady so I just kept the cadence high and powered round the hairpins (this is how I like to imagine myself, the reality may be slightly different). I descended the few miles down the other side to El Burgo, but having covered 40 miles already I knew I needed to turn around and retrace my route home. This was a shame as by all accounts the section from El Burgo to Ronda is stunning. Here’s my route for Strava fans. The other road that I enjoyed off the A-7053 was the A-387 to Mijas (the old town on the hill, not the tourist centre on the coast). Despite being an A road, the surface alternates from wide and pristine to narrow and knackered, which makes for an engaging descent on the way back down… Beautiful views though. So putting cartography concerns aside, is it worth doing some cycling out there? Yes, without a doubt. To give you an idea of the climate, Andalusia’s week long stage race ‘Ruta Cyclista de Sol’ is in mid February and watching it on TV this year it looked sweltering. I really wouldn’t want to ride out there in the height of summer but the 25ºC at the end of October was perfect for me. As an off-season break from the British winter or an early spring tune-up I reckon it’s a winner and I’d love to go back again, hopefully exploring further inland. Anyway, that’s my fix of sun over with, it really is time to get stuck into the British winter now. Honestly.